Thermal mass is another vital and complimentary component of passive solar design. A material that has thermal mass is one that has the capacity to absorb, store and release the sun’s heat energy. Its density and levels of conductivity help to keep the internal temperature of a building stable. Objects that have thermal mass have inherent qualities for both heating and cooling. They are generally dense materials, such as concrete, stone, brick or ceramic tile. In the diagram to the right, the thermal mass absorbs and distributes heat energy. Water also is very dense and has a high capacity to store and release heat. It, however, is more difficult to build into the design of houses. When thermal mass is used for its heating capacity, when exposed to sunlight, the thermal mass absorbs the sun’s heat energy. Because objects with thermal mass are typically dense, they have the ability to conduct heat. Because of this, all of the thermal mass does not need to be exposed to the direct sunlight, but a large portion of it should be. The heat energy that is absorbed will slowly spread (conductivity) through the mass and then radiate or release the heat energy throughout the evening and night. If marble is kept in the shade, it will keep a building cool. Thermal mass can be used for its capacity keep a structure cool during the hotter summer months. Have you ever felt the coolness of marble on a hot summer day? If dense objects with thermal mass are kept out of the sun, they will tend to stay cool and thus, help to keep the building cool. 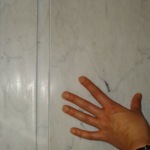 I was in a hot, humid city when I went into a building and leaned up against the cool marble. While it was hot and muggy outside, because the marble was in the shade, it was cool. The summer sun’s heat energy can and should be blocked from entering the building and hitting the thermal mass, by an overhang or other type of device or entry way. In the evening, when it is cooler outside, a passive solar building can be opened up to absorb the cooler evening and night temperatures within its mass. The dense material can cool and will absorb heat the following day. While somewhat simplistic, these pictures show how thermal mass works. The two pictures that follow were taken within seconds of one another. 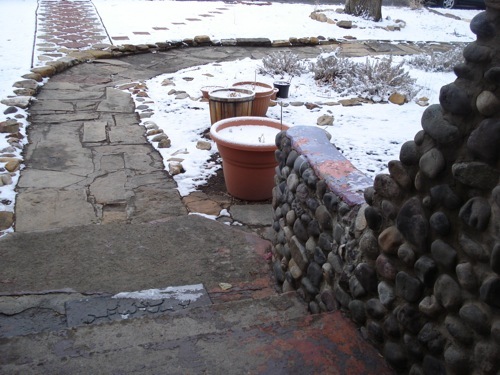 Stones and other dense material have thermal mass and retain heat. The radiant heat from the stones melted the snow that fell onto them. I awoke one morning to snow on the ground and realized that because the sun was shining its heat energy the previous day, I did not have to shovel the snow that fell in front of the house. I did, however, need to shovel snow in the back of the house. Why? Because of the differing objects’ capacity to store and release heat energy (the thermal mass) that the snow fell on. Heat energy was stored in the rocks in the sidewalk, as well as in the larger cement-type paverstones in the walkway because these dense types of materials have thermal mass. 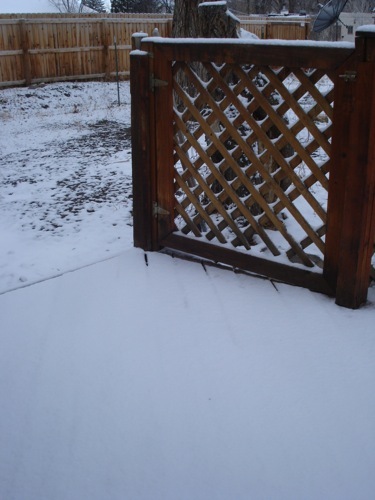 While the snow fell evenly onto the ground in front of, and in back of the house, the materials with thermal mass had heat energy stored within them from the sun shining on them the previous day. The radiant heat was released through the evening and night and had melted the snow. The wooden deck, however, does not have (relatively large amounts of) thermal mass. Although the winter sun shines on it in the afternoon, it does not have thermal mass and does not retain heat. Thus, I had to shovel it. 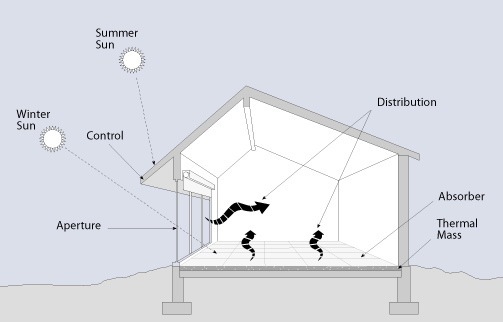 Ideally, within passive solar design, the thermal mass is located inside of the building and is well insulated to keep the structure warm in the winter.